The untold story of the GI movement to end the war in Vietnam. In the 1960's an anti-war movement emerged that altered the course of history. This movement didn't take place on college campuses, but in barracks and on aircraft carriers. It flourished in army stockades, navy brigs and in the dingy towns that surround military bases. It penetrated elite military colleges like West Point. And it spread throughout the battlefields of Vietnam. It was a movement no one expected, least of all those in it. Hundreds went to prison and thousands into exile. And by 1971 it had, in the words of one colonel, infested the entire armed services. Yet today few people know about the GI movement against the war in Vietnam. The Vietnam War has been the subject of hundreds of films, both fiction and non-fiction, but this story-the story of the rebellion of thousands of American soldiers against the war-has never been told in film. This is certainly not for lack of evidence. By the Pentagon's own figures, 503,926 "incidents of desertion" occurred between 1966 and 1971; officers were being "fragged"(killed with fragmentation grenades by their own troops) at an alarming rate; and by 1971 entire units were refusing to go into battle in unprecedented numbers. 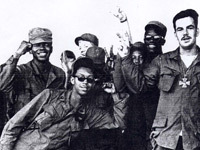 In the course of a few short years, over 200 underground newspapers were published by soldiers around the world; local and national antiwar GI organizations were joined by thousands; thousands more demonstrated against the war at every major base in the world in 1970 and 1971, including in Vietnam itself; stockades and federal prisons were filling up with soldiers jailed for their opposition to the war and the military. Yet today, with hundreds of thousands of American GIs once again occupying countries on the other side of the world, these history-changing events have been erased from America's public memory. SIR! NO SIR! aims to change all that. The film does four things: 1) Brings to life the history of the GI movement through the stories of those who were part of it; 2) Reveals the explosion of defiance that the movement gave birth to with never-before-seen archival material; 3) Explores the profound impact that movement had on the military and the war itself; and 4) Tells the story of how and why the GI Movement has been replaced with the myth of the spat-upon veteran. SIR! NO SIR is a film that challenges deeply-held beliefs not just about the Vietnam War and those who fought it, but about the world we live in today. It is a vivid portrayal of William Faulkner's famous observation that "The past isn't dead; it isn't even past." NOTE: Speakers are available to appear at screenings of this film. They include the director, David Zeiger, veterans and academics who appear in the film, and veterans from the Iraq War. Please inquire. "David Zeiger's superb documentary about the Vietnam War era's GI protest movement is jammed with incident and anecdote and moves with nearly as much breathless momentum as the movement itself." "Because it's bolstered by proud memories of Vietnam vets who turned against the war, Sir! No Sir! rings with an exultant, even elated tone." "A 'must-see' documentary which seeks to return to the historical record the pivotal story of the GI anti-war movement during the Vietnam War." "A powerful documentary that uncovers half-forgotten history, history that is still relevant but not in ways you might be expecting." "This is powerful stuff, offering us not only a new look at the past, but to the unavoidably relevant insights into the present." "A tight, engrossing and excellent chronicle of the movement made by these heroic men who chose to question authority instead of falling in line." "The soldiers' disillusionment at what they saw in Vietnam is palpable, and Zeiger does a service by bringing their stories out of history's forgotten files and into the light. " "Sir! No Sir! movingly captures the raw excitement of grunts discovering their power and their voices in their ability to resist." "The voices of the veterans alone, however, make this an important and poignant film that can speak to any generation." "Zeiger's movie is a timely salute to the risky and brave men and women who had the temerity not only to think for themselves but to speak their minds." "This compelling documentary by director David Zeiger recounts what were more than half a million 'incidents of desertion' during the war, many of them acts of direct rebellion against the legitimacy of the war." "Honors those who fought, then questioned the morality of that fight, then joined the national protest." "Shines a light on a forgotten corner of the antiwar movement: the men (and a few women) who returned from their tours of duty filled with doubt and disillusionment over what they saw, and did, there." "This is an important chapter in the Vietnam library of films." "Sir! No Sir! so vividly evokes the rage, passion and provocation of the era it chronicles that it feels up-to-the-minute." Tour of rapidly urbanizing Hanoi, and the effect on citizens and culture. Vietnamese women build on experiences of war. Two theater companies, one American, one Vietnamese, collaborate to produce A Midsummer Night's Dream in Hanoi. "An impressive presentation... [Sir! No Sir!] makes a strong case that history has been rewritten to erase the evidence of veterans' participation in the antiwar movement. There's a lot of fascinating material here for viewing, discussion, and, surely, debate. Excellently filmed, edited, and engineered... Very highly recommended." "*** [Sir! No Sir!] is a compelling tribute to men and women who exhibited real courage and commitment on a different kind of battlefield--one that will surely carry resonance... Recommended." "The powerful, profound emotions evoked by Sir! No Sir, a film about the spontaneous to begin with, then organized, resistance on the part of U.S. soldiers to the war in Vietnam remain with you long after the film is over...In the film talking heads alternate with contemporary documentary footage. The contrast between the unblemished faces of the young men and women back when and their sometimes weathered, sometimes serene present faces is so deeply affecting that finally, it's the extraordinary moral and physical courage of the individuals who instinctively and intellectually knew right from wrong that movingly stays with you, and continues to stay. Highly Recommended."